The inspirational words of Anne Graham Lotz tell of the joys and comforts of heaven. 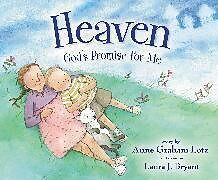 The beautiful rhyming text and engaging, familiar images help children understand that heaven is real and Jesus is waiting for them to come someday. The light is always onBecause Jesus is waiting for you.The very best part of HeavenIs that He's going to be there too.Heaven is a real place. It's where Jesus lives and waits for those he loves to come to him. It's a place of joy and love and hopea place where all of God's children, young and old, will stay and be happy forever.Engaging questions and scripture references in the back of this book will help parents reinforce the message that Heaven is a place of love that we can all look forward to seeing one day. There's even a special keepsake invitation for children to RSVP to Jesus!